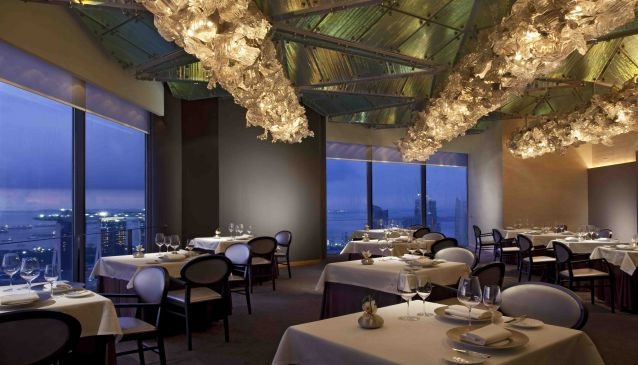 There's a culinary gem on the 70th floor of the Swissôtel The Stamford. JAAN, which means in ancient Sanskrit 'bowl', is a multi-award winning restaurant serving fine French cuisine in the heart of the Civic District. At JAAN, you will experience an impeccable service and scrumptious innovative dishes created by French Chef Julien Royer. Imbued with the value and the beauty of seasonally grown produce, the artist selects for his artisanal menus only the very best products from around the world to bring out and enhance their flavours in the most creative and ambrosial dishes. The experience is simply divine! The star dish here is the 55' Smoked Organic Egg, Smoked Rattes, Autumn Mushrooms, Chorizo Iberico and Buckwheat. Among the latest awards JAAN was awarded the Indoguna Restaurant Of The Year 2014 while chef Julien Royer ranked #17 on Asia's 50 Best 2014 (SG).